I took part in the Goodwill’s Pre-Thanksgiving lunch for the homeless and less fortunate people in Baltimore, and it was simply amazing. I had the opportunity to spend time with so many people, and I felt like a true celebrity. On November 14, 2010, the past and present Ms. Wheelchair MD, and Ms. Wheelchair DC came together to take part in the activities leading up to the crowning of Ms. Wheelchair DC 2011…Jameika Andrews. Congratulations Jameika, I’ll see you at the Nationals in Michigan. Congratulations to Sharonda Johnson-Wilkes from Fort Washington, Maryland. 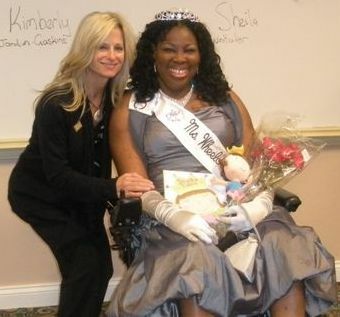 She was crowned as the 2011 Ms. Wheelchair Maryland on October 30, 2010 at the Hilton Hotel in Rockville. Sharonda will represent Maryland at the national pageant in Grand Rapids, Michigan in the summer of 2011.